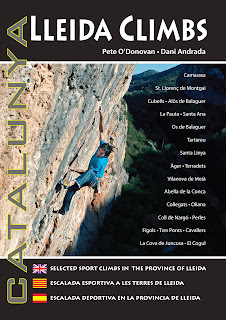 Lleida Climbs by Pete O’Donovan & Dani Andrada is an extremely popular and modern multilingual photo topo guide to all of the very best climbing areas surrounding the city of Lleida. Pete O’Donavan has lived and climbed in the region for over 20 years and he has teamed up with the ever enthusiastic Dani Andrda to produce a stunning and truly inspirational climbing guidebook for less than £30. In recent years sport climbing in the Catalan province of Lleida, situated in northeast Spain, has become increasingly popular and Lleida Climbs by Pete O’Donovan & Dani Andrada is widely recognised as the best climbing guidebook covering twenty one different zones including: Camarasa, Sant Llorenç de Montgai, Cubells, Alòs de Balaguer, La Pauta, Santa Ana, Santa Linya, Àger, Terradets, Vilanova de Meià, Abella de la Conca, Perles, Coll de Nargó, Tres Ponts and Oliana. Crammed within the 424 pages (88 more than the first edition) are almost 50% more routes, many of these are on newly developed sectors at places such as Camarasa, Terradets, Alòs de Balaguer and Abella de la Conca. Profits from the first edition of this guide have directly funded the development of these additional sectors and many more of the new routes included in this expanded and improved second edition. In total Llieda Climbs features close to 3,000 single and multi-pitch routes, from grade IV to 9b but note that half of these are below 7a so I can categorically say that Lleida is not just for hot-shots! For detailed recommendations for climbs below 7a read this short article: http://www.lleidaclimbs.com/p/recommendations-v-to-6c.html.